My first postdoctoral position, in Professor Alastair Fitter’s laboratory at the University of York, showed that symbiotic and pathogenic root fungi interact to influence plant fitness. The main output from the research in Alastair’s laboratory (Newsham et al. 1995, Journal of Ecology 83, 991-1000) was recently voted as being one of the top 100 most influential papers published by the British Ecological Society over the last century (see http://core.ecu.edu/chalcraftd/most%20influential%20BES%20papers.pdf). A spin-off from my research at York was the finding that the roots of apparently healthy plants are routinely colonised by a separate group of fungi, the dark septate endophytes (DSE). The ecological role of DSE, which is much less clear than that of mycorrhizas, has been a focus for my research (e.g. Newsham 1999, New Phytologist 144, 517-524; Newsham et al. 2009, Fungal Ecology 2, 10-20). Experiments by Dr Rebecca Upson in Professor David Read’s laboratory at the University of Sheffield showed that DSE, identified by sequencing of the ITS1-5.8S-ITS2 nuclear ribosomal gene cluster as Oculimacula yallundae and species of Mollisia and Tapesia, have positive effects on the in vitro growth of Antarctic Hairgrass when nitrogen is supplied to plants in organic form (Upson et al. 2009, Mycorrhiza 20, 1-11). A meta-analysis of data from the literature similarly showed that DSE improve plant above- and belowground biomass when organic nutrients are supplied to plants, and provides evidence that DSE have positive effects on their host plants (Newsham 2011, New Phytologist 190, 783-793). Joint NERC funding with Davey Jones’ group at the University of Bangor has also determined the influence of DSEs on organic nitrogen assimilation by Antarctic hairgrass (see Hill et al. 2011, Nature Climate Change 1, 50-53). Mycorrhizal symbioses are less frequent in polar ecosystems than they are at lower latitudes (Upson et al. 2008, Arctic, Antarctic and Alpine Research 40, 592-599; Newsham et al. 2009, Fungal Ecology 2, 10-20), but some species of leafy liverwort in these habitats consistently form mycothalli, associations with fungi that bear remarkable similarities to mycorrhizas. The aim of my research on mycothalli is to document the fungi present in the tissues of leafy liverworts in Antarctic and Arctic ecosystems, and, ultimately, to understand their influence on the nutrient balance and survival of hepatics in polar habitats. Research by Rebecca Upson in David Read’s laboratory showed that the leafy liverwort Cephaloziella varians is consistently colonised by the ericoid mycorrhizal symbiont Rhizoscyphus ericae over a 1,875 km transect from South Georgia through to Alexander Island (Upson et al. 2007, New Phytologist 176, 460-471). Direct PCR on Lophozia excisa and Barbilophozia hatcheri, other leafy liverworts of the high maritime Antarctic, has similarly shown plants to be consistently colonised by fungi in Sebacinales clade B, which are members of mycorrhizal associations with higher plants on other continents (Newsham & Bridge 2010, Mycorrhiza 20, 307-313; Newsham et al. in press, Fungal Ecology). Ongoing work at the NERC Arctic station at Ny-Ålesund on Svalbard in the High Arctic has determined the presence of fungi in 15 species of leafy liverworts, including species of Cephaloziella, Cephalozia, Barbilophozia, Lophozia and Tritomaria. Direct PCR, using custom-designed primers, has recently been used to determine whether or not these hepatics harbour the same fungi as those in the Antarctic and temperate habitats. Newsham, K.K., Garnett, M.H., Robinson, C.H. & Cox, F. (2018). Discrete taxa of saprotrophic fungi respire different ages of carbon from Antarctic soils. Scientific Reports 8:7866. Newsham, K.K., Eidesen, P.B., Davey, M.L., Axelsen, J., Courtecuisse, E., Flintrop, C., Johansson, A.G., Kiepert, M., Larsen, S.E., Lorberau, K.E., Maurset, M., McQuilkin, J., Misiak, M., Pop, A., Thompson, S. & Read, D.J. (2017). Arbuscular mycorrhizas are present on Spitsbergen. Mycorrhiza 27, 725–731. Benhua, S., Dennis, P.G., Newsham, K.K., Hopkins, D.W. & Hallett, P.D. (2017). Gelifluction and thixotropy of maritime Antarctic soils: small-scale measurements with a rotational rheometer. Permafrost and Periglacial Processes 28, 314–321. Cox, F., Newsham, K.K., Bol, R., Dungait, J.A.J., Robinson, C.H. (2016). Not poles apart: Antarctic soil fungal communities show similarities to those of the distant Arctic. Ecology Letters 19, 528–536. Newsham, K.K., Hopkins, D.W., Carvalhais, L.C., Fretwell, P.T., Rushton, S.P., O’Donnell, A.G., & Dennis, P.G. (2016). Relationship between soil fungal diversity and temperature in the maritime Antarctic. Nature Climate Change 6, 182–186. Amos, G.C.A., Borsetto, C., Laskaris, P., Krsek, M., Berry, A.E., Newsham, K.K., Calvo-Bado, L., Pearce, D.A. & Wellington, E.M.H. (2015). Designing and implementing an assay for the detection of rare and divergent NRPS and PKS clones in European, Antarctic and Cuban soils. PLoS ONE 10(9): e0138327. Ellis, L.T. et al. incl. Newsham, K.K. ; 2014 New national and regional bryophyte records, 41. Journal of Bryology. Newsham, K.K., Goodall-Copestake, W.P., Ochyra, R. & Váňa, J; 2014. Mycothalli of the hepatic Barbilophozia hatcheri in Antarctica: distribution and identities of mycobionts. Fungal Ecology. Ellis, L.T. et al. incl. Newsham, K.K. ; 2013 New national and regional bryophyte records, 35. Journal of Bryology. Broughton, R.C.I., Newsham, K.K., Hill, P.W., Stott, A. & Jones, D.L. (2015). Differential acquisition of amino acid and peptide enantiomers within the soil microbial community and its implications for carbon and nitrogen cycling in soil. Soil Biology and Biochemistry 88, 83-89. Dennis, P.G., Newsham, K.K., Rushton, S.P., Ord, V.J., O’Donnell, A.G. & Hopkins, D.W. (2013). Warming constrains bacterial community responses to nutrient inputs in a southern, but not northern, maritime Antarctic soil. Soil Biology and Biochemistry 57, 248-255. Laudicina, V.A., Benhua, S., Dennis, P.G., Badalucco, L., Rushton, S.P., Newsham, K.K., O’Donnell, A.G., Hartley, I.P., Hopkins, D.W. (2015). Responses to increases in temperature of heterotrophic micro-organisms from the maritime Antarctic. Polar Biology 38, 1153–1160. Ellis et al., incl. Newsham, K.K. (2014). New national and regional bryophyte records, 41. Journal of Bryology 36, 306-324. Newsham, K.K., Goodall-Copestake, W.P., Ochyra, R. & Váňa, J. (2014). Mycothalli of the hepatic Barbilophozia hatcheri in Antarctica: distribution and identities of mycobionts. Fungal Ecology 11, 91-99. Benhua, S., Dennis, P.G., Laudicina, V.A., Ord, V.J., Rushton, S.P., O’Donnell, A.G., Newsham, K.K., Hopkins, D.W. (2014). Biogeochemical responses to nutrient, moisture, and temperature manipulations of soil from Signy Island in the maritime Antarctic. Antarctic Science 26, 513-520. Pearce, D.A., Newsham, K.K., Thorne, M.A.S., Calvo-Bado, L., Krsek, M., Laskaris, P., Hodson, A. & Wellington, E.M.H. (2012). Metagenomic analysis of a southern maritime Antarctic soil. Frontiers in Microbiology 3, article no. 00403. Dennis, P.G., Rushton, S.P., Newsham, K.K., Lauducina, V.A., Ord, V.J., Daniell, T.J., O’Donnell, A.G. & Hopkins, D.W. (2012). Soil fungal community composition does not alter along a latitudinal gradient through the maritime and sub-Antarctic. Fungal Ecology 5, 403-408. Tojo, M. & Newsham, K.K. (2012). Snow moulds in polar environments. Fungal Ecology 5, 395-402. Newsham, K.K. (2012). Fungi in extreme environments [editorial]. Fungal Ecology 5, 379-380. Hill, P.W., Farrell, M., Roberts, P., Farrar, J., Grant, H., Newsham, K.K., Hopkins, D.W., Bardgett, R.D. & Jones, D.L. (2011). Soil- and enantiomer-specific metabolism of amino acids and their peptides by Antarctic soil micro-organisms. Soil Biology and Biochemistry 43, 2410-2416. Hill, P.W., Quilliam, R.S., DeLuca, T.H., Farrar, J.F., Farrell, M., Roberts, P., Newsham, K.K., Hopkins, D.W., Bardgett, R.D. & Jones, D.L. (2011). Acquisition and assimilation of nitrogen as peptide-bound and D-enantiomers of amino acids by wheat. PLoS ONE 6: e19220. Newsham, K.K. (2011). A meta-analysis of plant responses to dark septate root endophytes. New Phytologist 190, 783-793. Hill, P.W., Farrar, J., Roberts, P., Farrell, M., Grant, H., Newsham, K.K., Hopkins, D.W., Bardgett, R.D. & Jones, D.L. (2011). Vascular plant success in a warming Antarctic may be due to efficient nitrogen acquisition. Nature Climate Change 1, 50-53. Newsham, Kevin K., Davidson, Andrew T.. (2012) High ultraviolet radiation environments. In: Life at extremes: Environments, organisms and strategies for survival, Oxfordshire, CABI, 454-473. Bridge, P.D., Newsham, K.K.. (2009) Soil fungal community composition at Mars Oasis, a southern maritime Antarctic site. Fungal Ecology, 2. 66-74. Newsham, K.K., Maslen, N.R., McInnes, S.J.. (2006) Survival of antarctic soil metazoans at −80°C for six years. CryoLetters, 27. 269-280. Jumpponen, Ari, Newsham, Kevin K., Neises, Daniel J.. (2003) Filamentous ascomycetes inhabiting the rhizoid environment of the liverwort Cephaloziella varians in Antarctica are assessed by direct PCR and cloning. Mycologia, 95. 457-466. 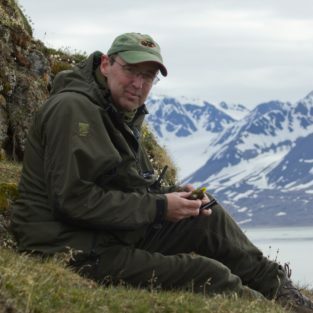 A paper from my first postdoctoral position in Professor Alastair Fitter’s laboratory at the University of York was recently listed as one of the top 100 most influential papers published by the British Ecological Society over the last century (see http://core.ecu.edu/chalcraftd/most%20influential%20BES%20papers.pdf). In 2017, Web of Science ranked my single author 2011 New Phytologist article 220th out of the 95,409 articles published in the Plant Sciences category between 2010 and 2014.